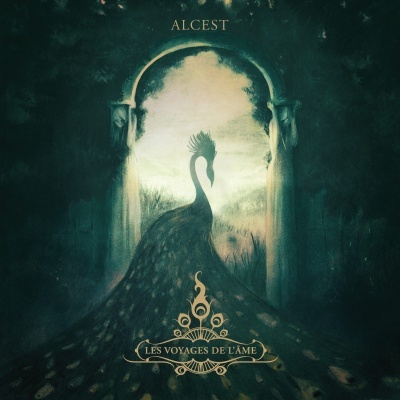 Alcest – Les Voyages De L’Âme | "I Prefer Their Old Stuff"
2010’s Écailles de Lune was my first exposure to French band Alcest, the project of multi-instrumentalist Neige, its mixture of post-rock/metal, shoegaze and elements of black metal really hit all the right notes and I became addicted for a few weeks playing it constantly. January 6th brought their new album Les Voyages De L’Âme (Journeys of the Soul), which was a rather nice birthday present for me! It is also the first new album I have heard this year, and a pretty nice start it is too. The music on this, their third album proper, has reigned back the black metal so much as to be positively wrong to tag this as such. Neige’s harsh vocals have been limited to just two tracks out of the eight here and even then as only a small part of the song. Instead he has expanded the range of his clean singing and actually has a pretty nice voice, although with my French being extremely limited I have no idea what he’s singing about. A few searches around the ‘net seems to indicate that they all seem to lie in the realm of fantasy, fairy tales and other such prog territories, most un-black metal I think you’ll agree! When I posted the video to “Percées de lumière” off Écailles on Facebook last year in the midst of my brief obsession, one of my friends classified it as metal for people who don’t like metal and I think you could certainly say that Les Voyages fits this description even more. The words metal, black, harsh vocals will have a lot of people instantly turning off, but here these elements are a small percentage of the whole, there but not overly insistent. It is the sort of album that could act as the perfect gateway for the more cautious listener into darker, harsher territory. If this might be you then I recommend giving Agalloch’s “Ashes Against The Grain” a go next! My one criticism of this new album would be that it doesn’t really progress on anything that was on its predecessor, the motto “if it ain’t broke don’t fix it” is a fine one but I feel it would have been nice for the band to try and expand on what had gone before, also with the almost complete reduction of the harsher elements it has lost some of its emotional impact and as such I am slightly concerned about its longevity compared to Écailles. But this is a relatively minor fault with what is a very fine album and although it hasn’t propelled me into the insatiable dribbling obsession Écailles De Lune did, I have found myself playing it pretty regularly since I got it last week. Don’t think I can say it’s the first “great” album of 2012 but it’s certainly the first “very good” one! This entry was posted on January 14, 2012, 1:01 pm and is filed under Music Reviews. You can follow any responses to this entry through RSS 2.0. You can leave a response, or trackback from your own site. I need to give this a whirl. I really liked Souvenirs d’un Autre Monde when it came out.